I hate for this to be our first blog post on the Bayside Joinery site, but so be it. On Monday, Jan 21, 2019, our shop at 51 Willow Oak Drive burned to the ground. 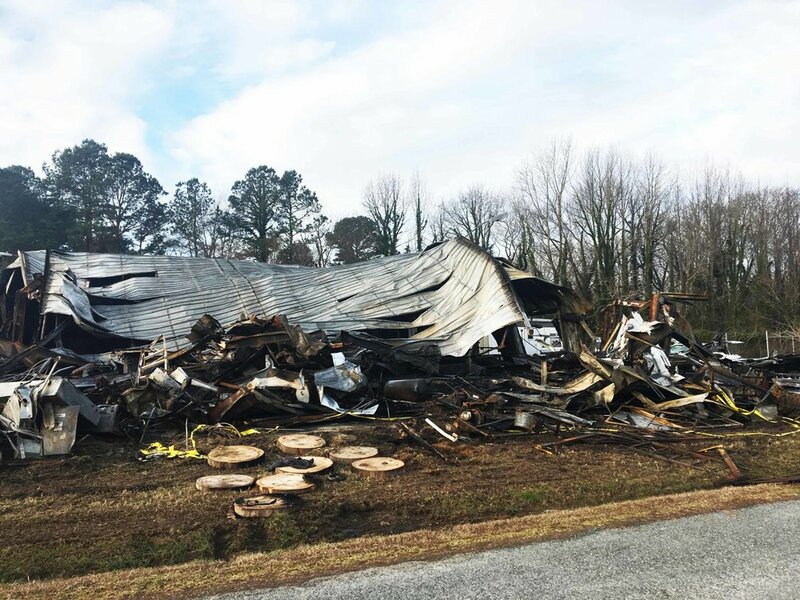 Hundreds of firefighters from Mathews county and the surrounding areas rushed to save our shop, but the blaze was far too large to prevent our woodshop from being completely destroyed. First and foremost, we’d like to thank all of the volunteer firefighters who arrived on the scene that day and helped contain the fire. We were told that a firefighter sustained burns on his arm, but that he will recover. Thankfully, nobody else was injured in the fire. Additionally, we’d like to thank our friends, family, and community who have been so supportive over the last couple of weeks. We have had so many calls of condolences and offers to help, it’s almost unbelievable. It’s impossible to understand the truly good nature of people until you experience it firsthand. The feeling of overwhelming loss of property coupled with the overwhelming response from the community has made the last couple of weeks an emotional roller coaster for Dad and me. We are forever grateful to you all. That’s all I am going to talk about the loss. I was raised to be a man of action. We don’t dwell on the past; we focus on the future. Right now that focus is on cleaning up the mess and rebuilding our shop so that we can continue to press forward with our hurricane resistant building systems. The cleanup process has honestly gone much better than I expected. When we first got to the site last Monday, we were met with a huge mass of twisted metal, ash, and what is left of our many tools we had in the shop. We began by carefully digging our way through the rubble. Things we could carry to the bin we picked up; things which were too heavy we either lifted with the crane or cut into smaller, more manageable chunks. Special thanks to Brett Pollard, who was gracious enough to lend us his gas-powered metal cutting saw. We would not be able to make our way through this mess without it. Honestly, we got more done in the first 5 days than I had thought we would. Piece by piece, we cut the metal into bite-sized chunks to be placed in the metal bin where they will be taken away to be recycled. I’d like to conclude by thanking all of our friends and family who have contributed to our GoFundMe page, which was created by Shannon to help fund the cleanup process. We could not do this without you. If you’d like to donate via our GoFundMe page, you can do so by clicking here. My plan is to update the blog weekly so that you can see our progress. We’ll be back at it next week. Thank you all for your support!